Neatly dug foundation trenches with steel reinforcing in place. This guide will help owner builders to cast foundations. These foundations are for external brick walls around a new house, or for extensions of an existing house. For single storey buildings with a tiled or sheeted roof in stable soil conditions, the minimum width of strip foundations should be 500mm for external walls and 400mm for internal walls. If a reinforced concrete roof is required on the house then the minimum width is 750mm for external walls and 600mm for internal walls. Trenches in sloping ground can be stepped with a minimum of 400mm overlap. Sloped trenches must not exceed 1:10 gradient. The minimum depth of the strip foundation trench must be at least 400mm below the original ground level. The average minimum thickness of the foundation must be at least 200mm. The strength of the concrete used for unreinforced strip footing must be at least 15MPa or better. For a double storey building reinforced foundations would require 25–30MPa. Trench sides and must be as near to vertical as possible. Trim the sides of the excavation to avoid holes being filled with concrete on the side faces. This wii require more concrete than estimated and will be a waste. When placing your concrete there are a few things to consider. Clear the soil that was excavated well away from the edges of the trench to stop it falling back into the trench and contaminating the concrete. If you are using wheelbarrows to ferry the cement then place planks along the edges where there is soft bedding such as fill material o prevent loose soil falling into trenches due to the weight of the wheelbarrows. Gently wet the excavation trenches before placing the concrete to avoid moisture being drained out of the concrete mix into the surrounding soil as this could weaken the foundation. Compact the concrete to remove any air bubbles. This will increase the density and strength. Fresh concrete needs to be protected from drying out too quickly. Gently spray water over the foundation as soon as the concrete has set. In hot dry areas the concrete can be covered with plastic sheeting to stop the concrete drying too quickly. Remove the plastic and spray water on to the concrete every so often to prevent it drying too quickly. When concrete looses moisture too quickly either by evaporation or absorption by the surrounding soil, it shrinks and if the concrete is not malleable, it will crack. See our article on drying in cold weather. How soon can bricklaying start on the foundation? Forty-eight hours after placing the concrete. You can build the first 500mm of brickwork to above the surrounding ground level. Then you must carefully wet the concrete thoroughly and backfill your trenches with soil. Seven days after placing the concrete foundation strips, they should be strong enough and your walls can be built up to roof level. At this stage, the concrete should have reached 60% of the final strength. Hi. I am planning to build a plastic bottle house like this one: https://diyprojects.ideas2live4.com/2015/10/02/how-to-build-a-house-using-plastic-bottles/. I want to know what the specs are for the foundation I will need to build. The walls of these structures are extremely strong on its own but I know I still need a foundation. Any help here would be appreciated because I would like it all to be legal and get my certificate even if it will be built on a plot or farm. Annelie, There is a misconception in SA that if you live on a farm or small holding you can build without plan approval. 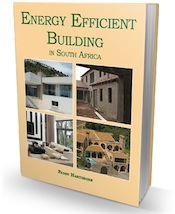 The law states that all buildings in SA have to have plans approved by the nearest local planning department. If it is a new house you will have to register with the NHBRC or get an exemption from them as an owner builder. The house has to conform to the SANS10400 building standards. The SANS10400 has no standard for a plastic bottle house building method. Any non-standard construction method needs to have approval from the SABS. The best advice is to contact an architect who knows what the process is and get his help for your approval. Another bit of advice here is that if you do build illegally and later you want to sell the new buyer will need plans especially if they apply for a bond from a bank. You will be in for penalties and you will have to do plans anyway. I m doing extension for my house(bondhouses) ,should I call structural engineering or building inspector for foundation? I presume you have plans? If the structural engineer is the competent person in charge of your build he/she should be checking on the build regularly. For the structure to be passed by council, it’s imperative that the building inspector is called in to check the foundation trenches – BEFORE you throw the concrete. He must also check at roof height (plus the roof trusses). All plumbing must also be checked by the building inspector. If you don’t follow this procedure you won’t get an occupation certificate. Hi Penny. Can you please give me your nr. I have a coyple questions i want to ask you. Lucas I am not available to answer calls telephonically. If you have questions please ask them here. A property owner has a plan for a single storey office building. He decides to change it into a double storey. What are the requirements especially with slabs (foundation and upper storey one) Also load bearing walls. Is is imperative to have a Structural Engineer’s certificate for the upper slab? You certainly need approved plans and may need a structural engineer’s certificate. Whoever draws your plans will be able to advise. hi, is it regulations to have rebar in the foundations. if not, is it recommended? also is it necessary to put waterproof sheeting in prior to cement pouring? I wanna build a small house of 30sq m and not willing to use stone(concrete) in foundation in rural land of Mokoane, it will be build out of home made cement block bricks. Will it resist for fewer years of my life, I will be 52 yrs old this December. No structure should be built without concrete foundations! Chances are if weather conditions are bad (e.g. heavy rain or strong wind) the house might collapse and kill you! You also need plans that should be approved by the local authority! Are you required to have a structural engineers certificate if you a single storey dwelling with corrugated roof built. Councils plans were approved and foundations adhered to SANS 10400. Hi Erik, If your plans were approved by council and they did not call for an engineers certificate then no you do not need one. The responsibility for your build rests with your “competent person”. We are building a house in Pongola Villa. I would like to know if all the houses in this complex are enrolled as well as in town. We were forced to enrol with you. When can we expect inspection. I expect from you to come very often as we are paying for this. I would like to hear from you soon. What is the standard size of width and depth of the building trenches in a normal 3 bedroomed house? It has nothing to do with the number of bedrooms in your house, it depends on the wall size. If there are going to be one-brick walls (230 mm thick) then your foundation must be 200 mm thick and 630 mm wide. Would like to find out how many rows of bricks must there be from above the lintels of an arch or window to the roof trusses. The length of the opening is 3.6 meters. Trevor, Part K: Walls of SANS 10400 has a lengthy table that specifies minimum depths of bed joint reinforced lintels required over openings of various spans up to 3,5 m – but this is in relation to the wall size (thickness) and roof span. The number of courses is specified here – but the other factor is the height of the course (depending what you are building with). Your plans should have been drawn up with reference to this. My plans for extensions to my house have been submitted and I have received approval regarding extension of building lines. My request to start building before approval was declined due to extensions been less that 500m2. The foundation trenches have been dug and the engineer has done DCP soil tests and I am waiting the results. The engineer is maintaining that whatever the results of the soil tests are (need re-enforcing or not) he needs to design the foundation and then inspect them once done, whereas the architect is saying that the engineer only needs to design the foundation if the soil tests determine that re-enforcing is required. Note: approval of plans not yet granted. Kindly advise on who is correct. Patrick, your architect is correct. The NBR states that “a competent person” must draw plans and design various elements of buildings (including foundations). The work involved will determine what qualification this person must have – a draughtsman, architect, engineer are all classified as competent persons, but, as an example, only an engineer would be able to design foundations for a high-rise building. In Part H: Foundations of SANS 10400, foundation design is discussed and basically it states that the design will usually be based on accepted design procedures and good building practice, or on “rational design methods in accordance with recognized engineering principles and practices”. In practice it is true that engineers usually draw structural details for plans (when required), including the position and cover required for reinforcement in foundation concrete. However, I don’t believe that an engineer’s design is always required when reinforcement is used – though it would be if the soil is problematic (e.g. dolomite or heaving clay, or if the soil is contaminated in any other way). 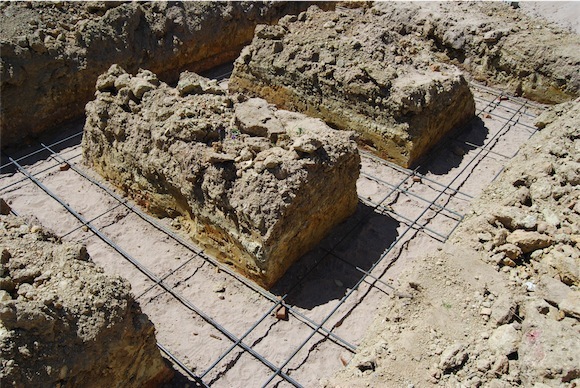 Also, many architects include straightforward reinforcement in foundations as a matter of course – even where soil tests are not required by council. Ultimately it will be up to the local authority to decide. As a matter of interest, Geotechnical site and environmental conditions are covered in Part F: Site Operations of SANS 10400. This places the responsibility for calling for geotechnical reports fairly and squarely on the shoulders of the local authority. Usually this is based on known unstable soil conditions in the area. i.e. It is not something that is mandatory on all properties. My guess. The engineer wants to get a foot in the door. So that if the soil tests say there is not need for a reinforced foundation designed by an engineer, he will have done something for which you will owe him. I have corner property and we are starting with building a wall. What is the minimum requirement that has to be in place (in terms of trenches/pegs) for the inspector to give the go ahead? If the wall is to be under 1,8 m it will be classified as minor building work, in which case you may not require plans or need a building inspector to inspect anything. But you do need to notify them that you are planning to build the wall, and you need to be sure that you don’t build on council property. Ask them what their requirements are. I’m using 10 litre buckets to measure the quantity of stone and sand for concrete of 20mpa with 13mm stone. Please advise on the number of buckets of each per 50kg of cement.